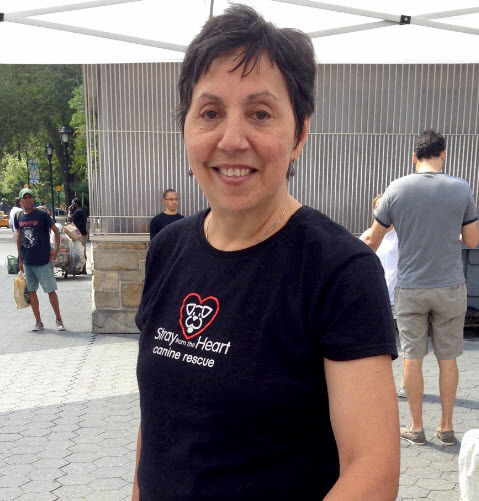 Stray from the Heart was founded in September 2000 by Beth Silberg, a trainer and lifelong animal rescuer, and Toni Bodon, an attorney and animal advocate. Beth and Toni first met at a crowded veterinary office in Manhattan. Both had heard about five wonderful Stray dogs who were being sent to the city pound, a high-kill shelter where many neglected and abandoned dogs are killed within days to make room for the next batch of strays. Unfortunately, the five dogs’ original rescuer was unable to find homes for them and continue paying for their boarding. That’s when Beth and Toni leapt into action and, in just one week, managed to find loving homes for three dogs. Beth took the remaining two dogs on a “foster care” basis, and within a month, both dogs were adopted to wonderful families. Beth and Toni discovered they had something special as partners: rescuing homeless dogs and finding them great homes. They continued their partnership and formalized it as a nonprofit organization in September 2000. Beth obtained her B.A. in special education from the New School in New York City. She is a Certified Personal Trainer and a licensed Active Isolated Teacher. In 1982, Beth founded Body Heat, Inc., a company specializing in the creation of personal training programs tailored to individual needs, specifically people with neuromuscular conditions. Beth’s devotion to the rescue and rehabilitation of homeless dogs eventually led to her full-time involvement with Stray from the Heart. Her time and attention is invaluable in the process of matching each dog’s temperament and qualities to the right human companion. Contact Beth at beth@strayfromtheheart.org. Toni is a practicing attorney in New York City, who specializes in state and local tax law. She also holds an M.S.W. in social policy, planning and administration from Fordham University and a B.A. in Education. For Toni, Stray from the Heart began in the early 1990s when she rescued an emaciated and badly abused pit bull puppy from the streets of Brooklyn. This puppy, named Misty, motivated Toni to rescue other dogs. She learned how to screen potential homes, recruit foster parents and train volunteers. She also learned how to negotiate below market prices for veterinary services, find the right dog trainer and develop a standard for enforceable adoption agreements. It took almost a year to find the perfect home for Misty, but during that period, the mission of Stray from the Heart was born. Today, Toni spends long and difficult hours rescuing homeless and abused dogs, making certain that each one is placed in a safe and loving home. Contact Toni at toni@strayfromtheheart.org.